Continuing an unusually rapid clearout of the Stateside docket, this Thursday saw the arrival of a new head for the largest diocese in the nation's eastern half. By population, of course, that'd be New York. By land area, however, it's the 38,000 square miles of the diocese of Jackson – four-fifths of the Magnolia State: a turf bigger than Indiana or Kentucky... and with the smallest Catholic community per capita of any US fold (less than 2.5 per cent), to boot. 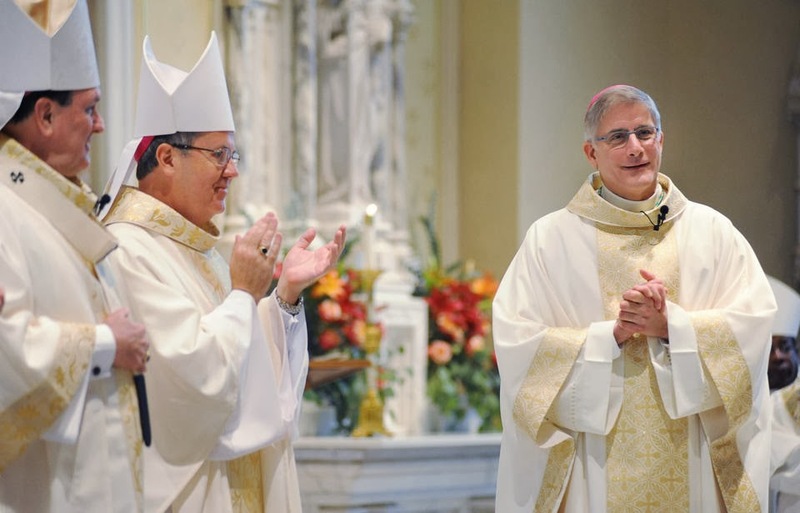 As if the spread wasn't daunting enough on its own, Bishop Joe Kopacz (above right) inherits a charge far removed from his lifelong ministry in Scranton. One of American Catholicism's poorest outposts, long a place with significant home-mission activity, the Jackson church has undergone several core shifts over the decade since its last transition, as the wrath of Hurricane Katrina tore through a sizable chunk of the ecclesial infrastructure, with a wave of Hispanic migration flooding in to work on the construction projects that followed. That said, admired by many as a happy, earthy pastor – and one with a PhD at that – the 63 year-old pick is said to have the stuff to meet the high-bar task. And, well, if you've consolidated parishes in Scranton and lived to tell the tale – as Kopacz just did, merging three churches into one in his last assignment up North – relatively speaking, the work ahead might even be easy. In any event, as the new arrival had never visited Mississippi before his December appointment, Providence aided the transition by sending a rather astonishing taste of home Southward today: "a brief dusting of snow" fell outside the antique Cathedral of St Peter the Apostle before the rites began. Returning to the new arrival's pointed sense of commentary, meanwhile, another flash of it showed in the run-up to today as, in an exit interview with his hometown's Times-Tribune, Kopacz talked of the "seedbed" of his vocation in the neighborhood where he grew up. "The whole milieu was supportive then," Kopacz said. "I can remember walking up to church to serve Mass wearing my cassock and surplice just so I wouldn't lose it. "Today, a kid would never put that on and walk," he added. "Oh, gosh, you'd be laughed off the block." 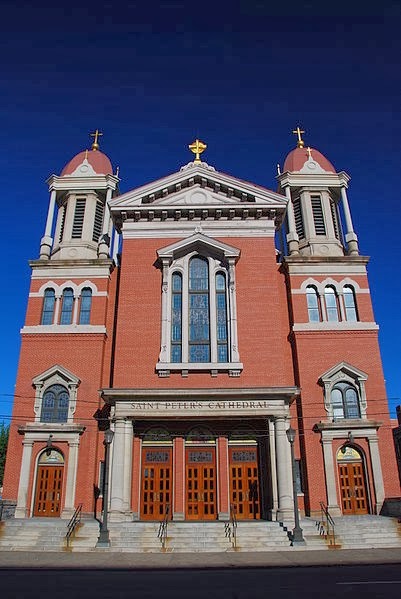 On a historic note, it's rather remarkable that – despite its legend as arguably the ultimate bastion of the ethnic, working-class Catholicism that defined and dominated the Northeast (and, by extension, the national church) for over a century – before today, the last time a Scranton lifer was exported to lead a diocese elsewhere came in 1926, when the then-auxiliary Andrew Brennan was named bishop of Richmond. In the time since, two sons of the city have gone on to be governor of Pennsylvania, another to the US Senate... and, of course, the sitting Vice President of the United States (who just yesterday invoked Francis on the stump). Still, the lapse hasn't meant a complete hat-drought: two of the diocese's last three shepherds have been native sons, and alongside Bishops Cliff Timlin and Joe Bambera, today's rites likewise saw the with-bells-on presence of Bishop Robert Morlino of Madison, a Scrantonian to the core, albeit formed by and ordained for the Jesuits. Looking back, however, as these days mark three decades since another prelate's departure from Scranton made international headlines, we'd be remiss to not recall the man and the milestone. Over many years and all kinds of circumstances, the city's seventh bishop touched and impacted countless lives, including among this crowd. Without him, so much would be very different – among others, what remains of the church's credible voice in the public square would probably be even more diminished... and in a particular way, the pro-life movement as we know it simply wouldn't exist. Of course, these weren't things John O'Connor accomplished principally up the Northeast Extension, but on the other side of Jersey as the eighth archbishop of New York. And so it was that, on 26 January 1984, John Paul II stunned the Establishment when – after all of seven months in Scranton – he launched the goldleafer's son-turned-Navy chaplain into the city the Saint-Pope invariably called "The Capital of the World." Whether in sweeping public gestures or striking kindnesses behind the scenes, what ensued makes for a million memories. But even if riding in with a blaze of glory and bestriding the earth might make for good copy, it's not the measure of a ministry – at least, one that's worth the word. For those of us who knew and loved him – which, granted, weren't always the same thing – it's a matter of regret that O'Connor didn't live to be captured and circulated in a viral age. It would've been wild, but even more, the lack of it means that there aren't many places one can hear that voice again. That's a personal sentiment, sure, but with it is a sense that what's still out there isn't simply timeless in its incisive relevance: if anything, it almost eerily fits this moment.